It only took 100 years from the publish date of the first volume of Edgar R. Burroughs’ JOHN CARTER sci-fi series to make the big screen; 100 years and about that many directors. One element or another of the JOHN CARTER series has been pursued for translation to a feature film (both animated and live action) since the 1930s, but for one reason or another, it was simply never able to make the leap. After most recently transporting itself from the directing-likes of James McTiernan, Robert Rodriguez, and John Favreau, the property ultimately came into the hands of Walt Disney and director Andrew Stanton. Ironically, the century-old story finally finds a release in the full digital age but in the hands of a first-time, live-action, director. While Stanton has certainly proven his game in the animated feature arena with stunners such as WALL-E and FINDING NEMO, there was certainly a bit of trepidation on whether he’d be able to mimic that success in this territory. Afterall, even though live-action films can contain as many digital elements as animated, and even though Stanton’s Pixar-partner, Brad Bird, seemed to calm similar apprehensions with his work for MISSION: IMPOSSIBLE - GHOST PROTOCOL, the world of animation and live-action can be as far apart as say Jasoom is from Barsoom. Be that uncertainty as it may, a pretty safe bet these days is to hire composer MICHAEL GIACCHINO for your sci-fi, animated, or action film. While he does score the occasional drama, teen comedy, or television show, Giacchino has become the go-to-composer for many of those who are climbing their way to the top of Hollywood’s young-directors-list. Giacchino has already proven his own world-leaping abilities moving from that of video games to television to feature filmS. 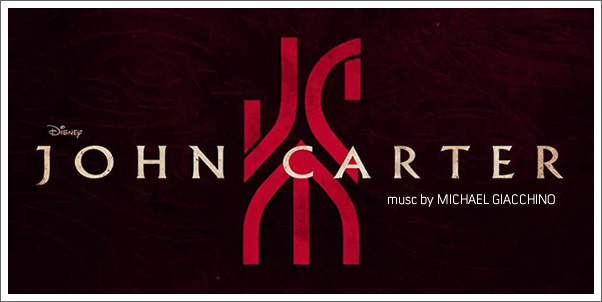 Now, for JOHN CARTER he has been tasked with scoring the leap of a 19th century hero across time and space.